I would argue yes. 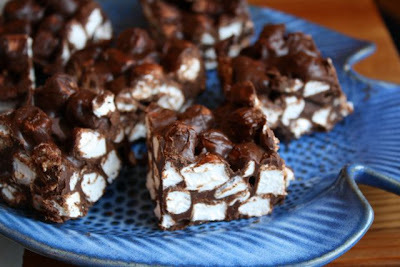 Especially when that marshmallow square is made up of dark chocolate, cashew butter, almond butter, and pristine white mini-marshmallows. The good thing is, it tastes a lot like the squares you may remember from potlucks in your childhood. Except that this square is grown up and sophisticated, just like you. Note: You may use any nut butter you please, including peanut. I happen to love almond and cashew. Melt the chocolate in the top of a double boiler. (Or in a bowl suspended over boiling water.) Stir in the butter. Remove from heat. Stir in the nut butters. Let it cool for 5 minutes. In the meantime, line an 8 x 8 inch baking dish with parchment paper. Cut 1-2 inch diagonal slits in each of the corners to help it sit more snugly. Pour the marshmallows into a separate bowl. Pour and scrape the melted chocolate mixture on top. 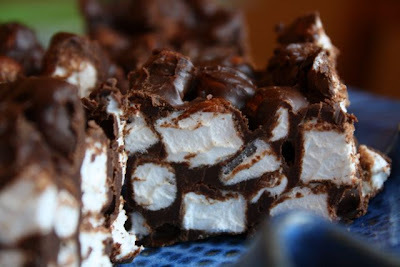 Stir it all together with a big spoon until every single little marshmallow is coated. Press the mixture into the prepared baking dish. Refrigerate until set – probably just over an hour. Enjoy your grown-up treat. That's very creative! I would like to indulge in these right NOW!